Después de leer el informe de Carlos Bethancourt sobre la presencia de un Vireo Ojiblanco* a la entrada de los laguitos del Summit, Euclides Campos y yo nos apersonamos a ese lugar hoy en la mañana. Apenas llegamos lo oimos cantar, y lo pudimos observar por bastante tiempo. No fué fácil retratarlo. 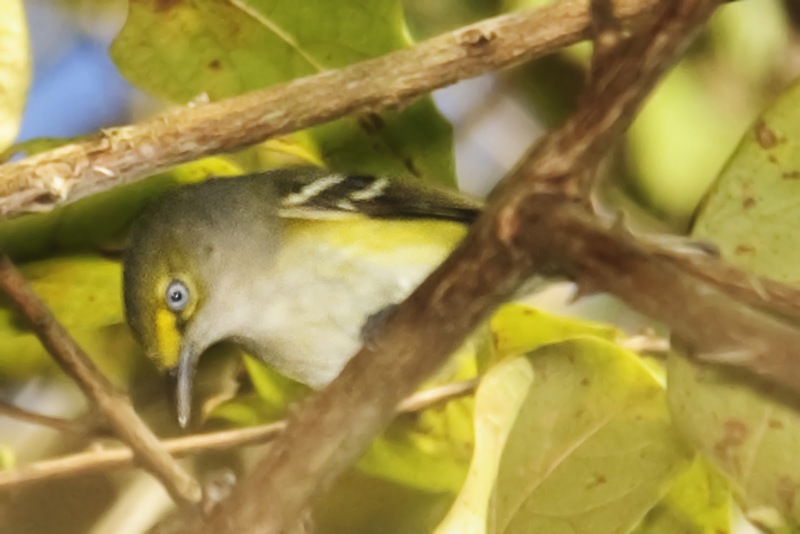 [*] Carlos' report, from his Facebook page: White-eyed Vireo at the entrance of Summit Ponds; almost a week in the same area, you can hear it calling. It is outside the gate in the small patch of dry forest. What a fantastic picture, Osvaldo! I went on the same day in the afternoon with Euclides "Kilo" Campos and my son Daniel Reyes. Although he popped out right away,he moved so quickly among the branches that I had a very hard time seeing him clearly. I don't know how you got such a good picture! Great job!